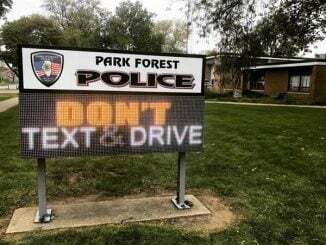 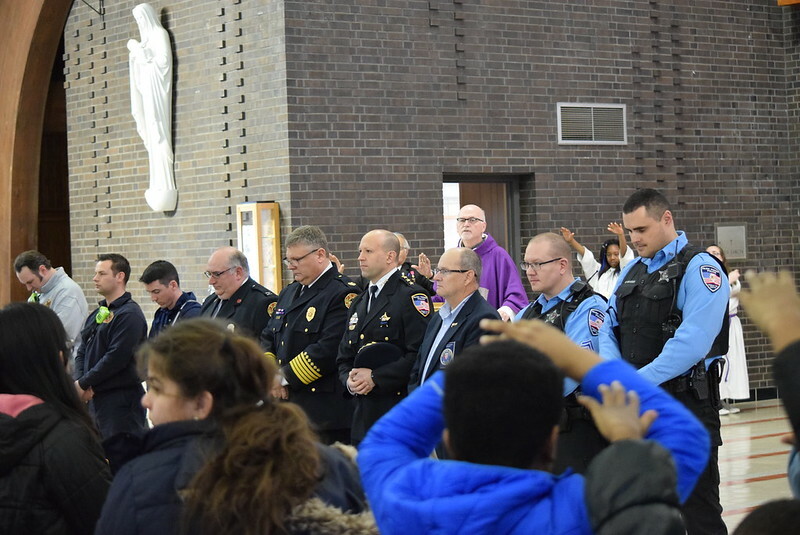 Park Forest, IL-(ENEWSPF)- Monday marks two years since Officer Tim Jones, Park Forest Police badge #204, fell to gunshots fired by 21-year-old Thurman Reynolds. 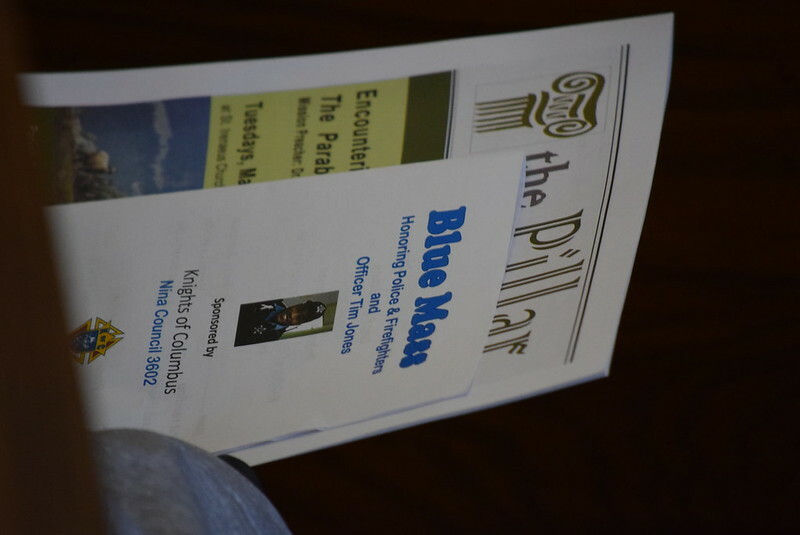 Officer Jones nearly died that day, and his continued recovery continues to inspire members of the PFPD and community. 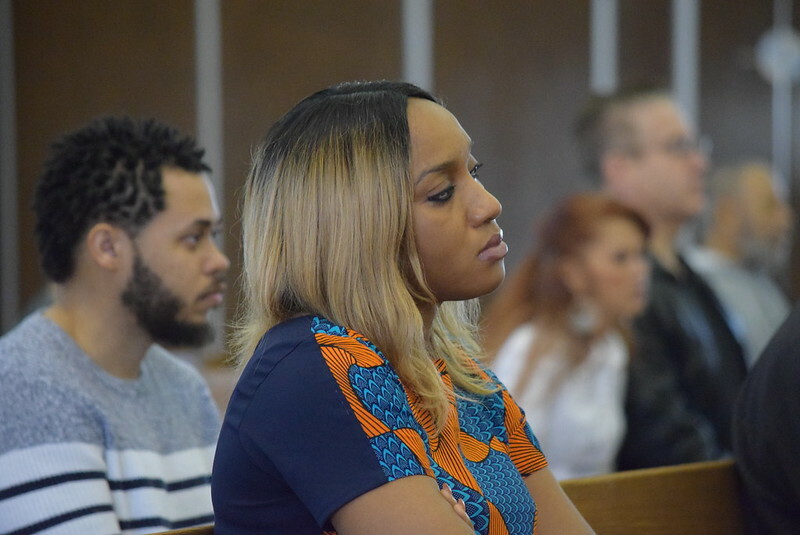 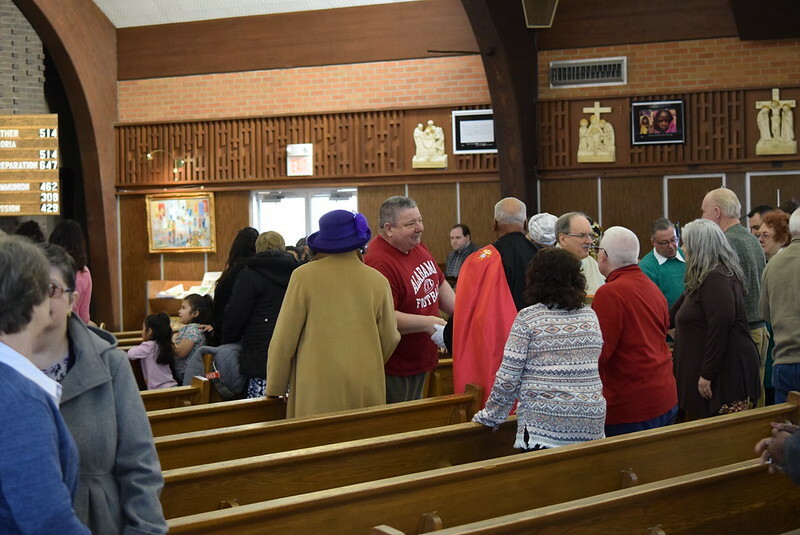 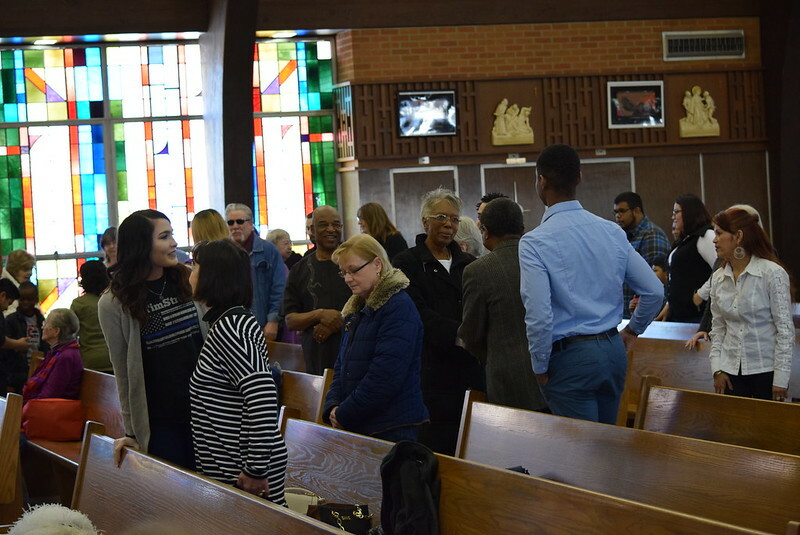 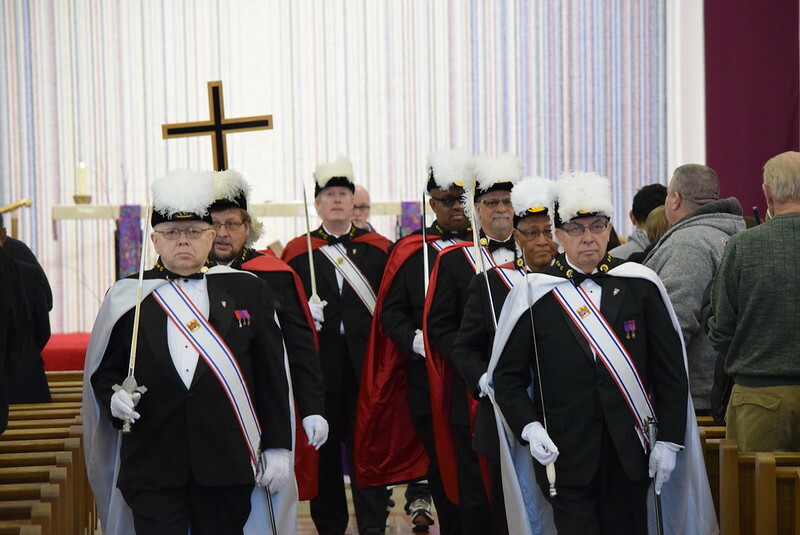 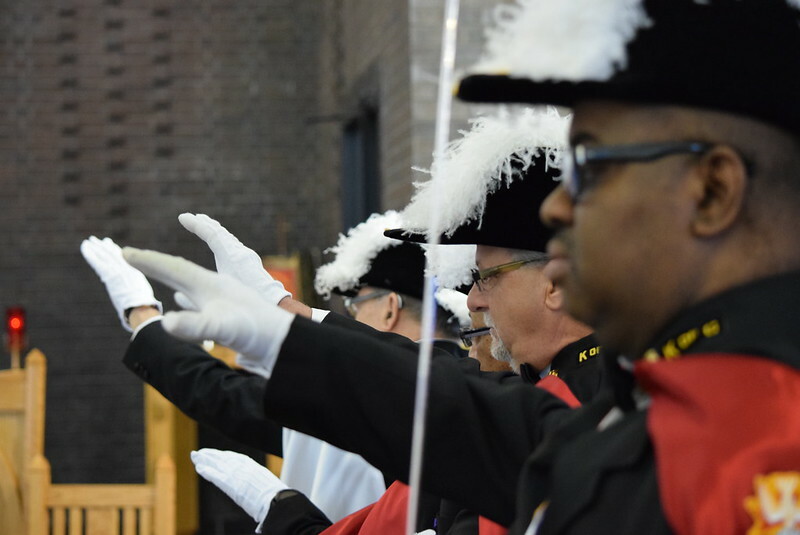 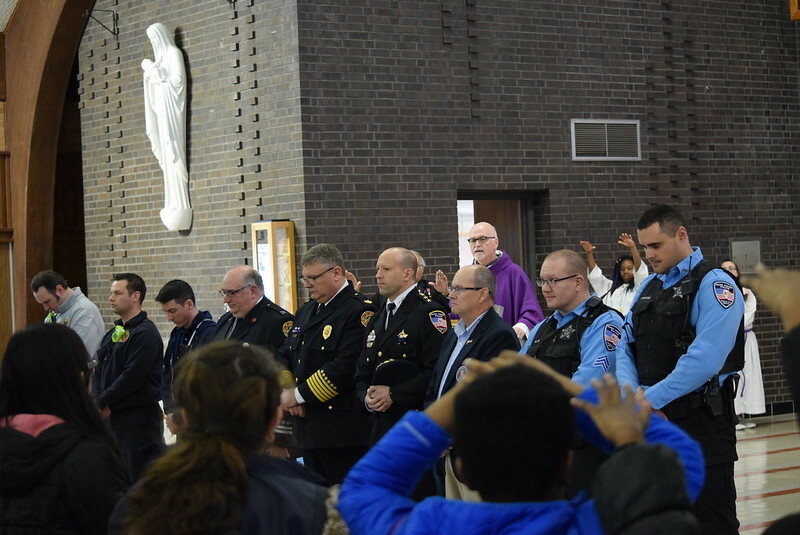 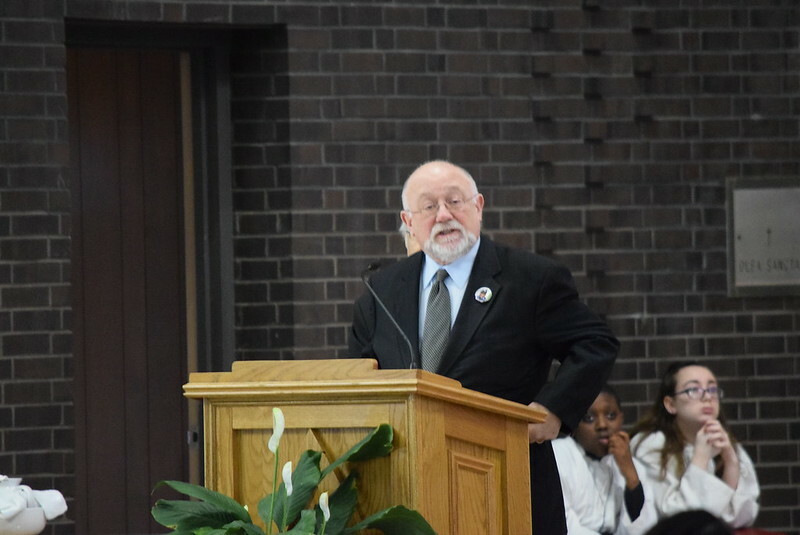 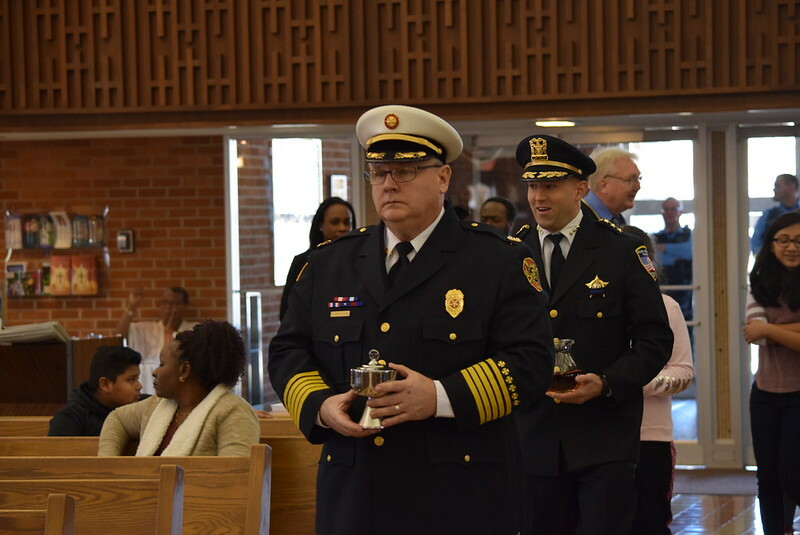 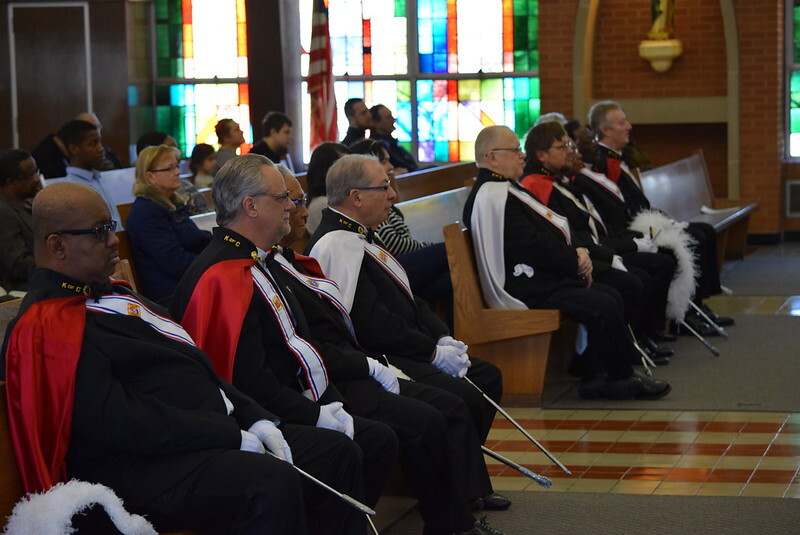 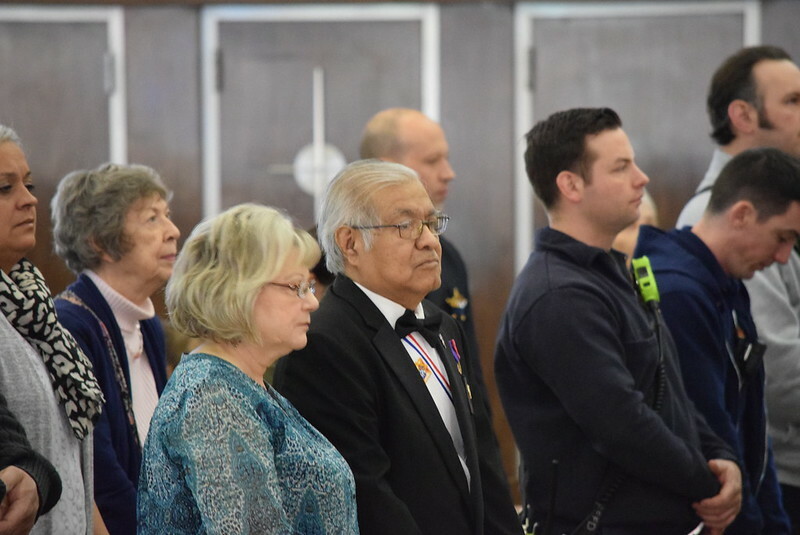 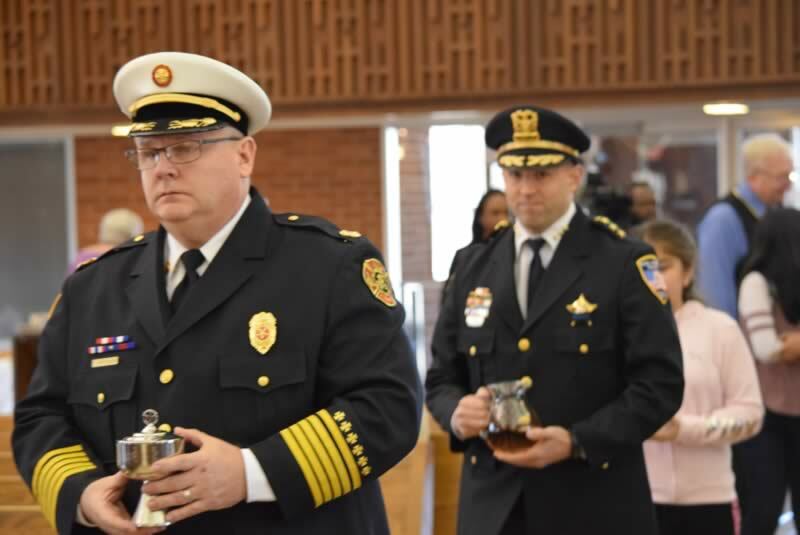 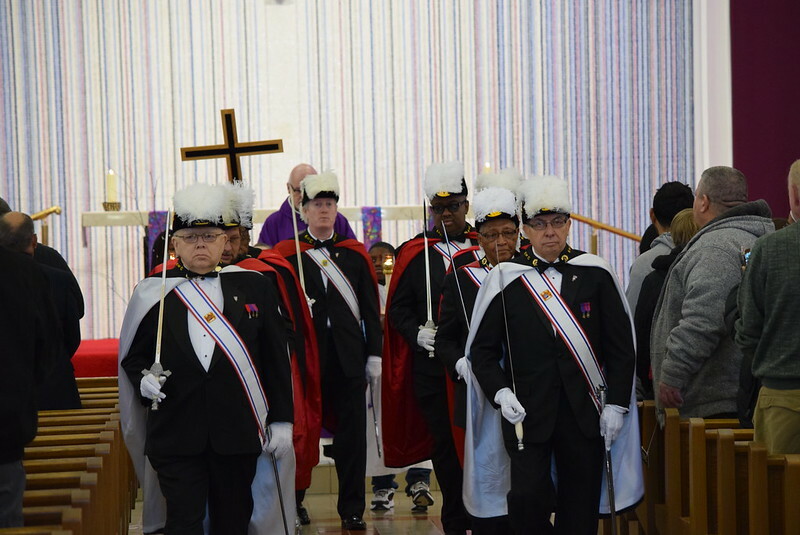 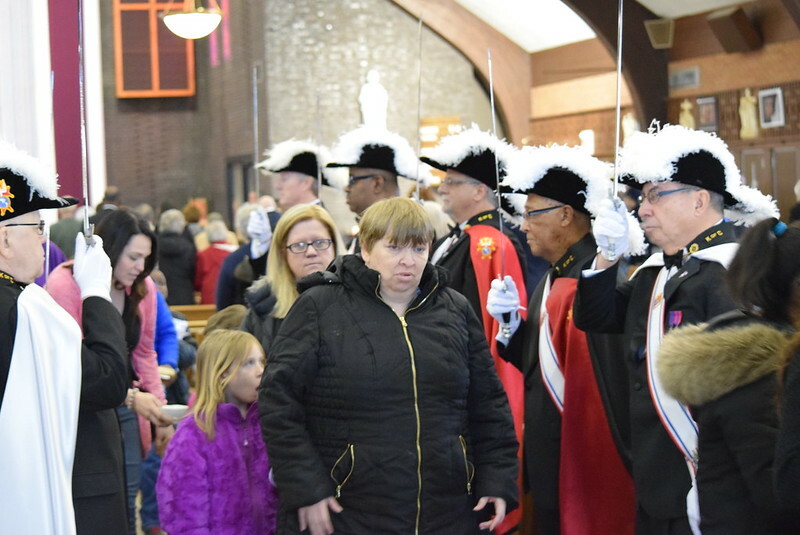 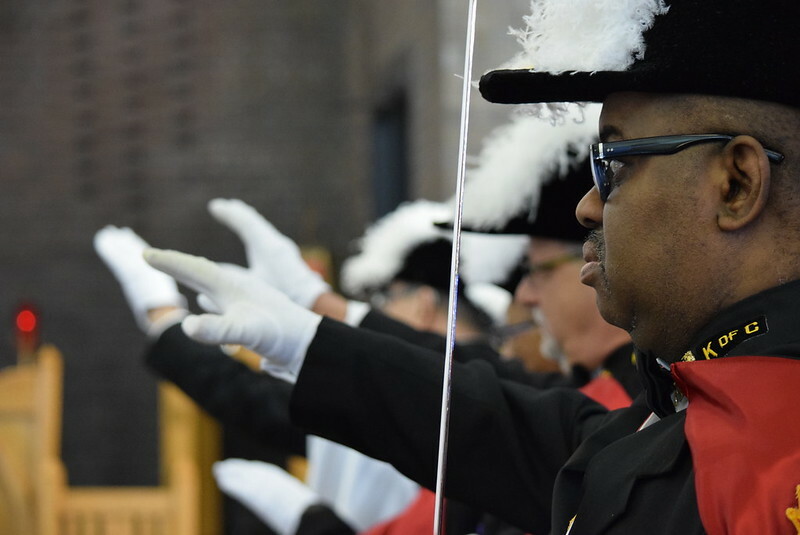 Sunday, the Knights of Columbus sponsored a Blue & Red Mass at St. Irenaeus Catholic Church, celebrating not only the women and men of the Park Forest Police and Fire Departments, but the hope that Officer Jones will one day return to active duty at the PFPD. 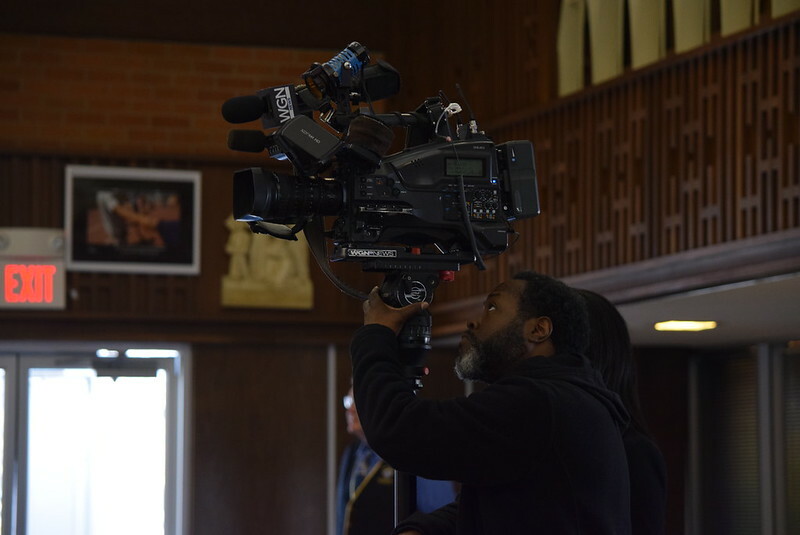 WGN Channel 9 Chicago was on hand to film the mass and the talks after the liturgy by Knights of Columbus member Michael Gonzalez, who organized the celebration; Father Terry Johnson, pastor of St. Irenaeus Church; Mayor John Ostenburg; Fire Chief Tracy Natyshok; and Police Chief Christopher Mannino. 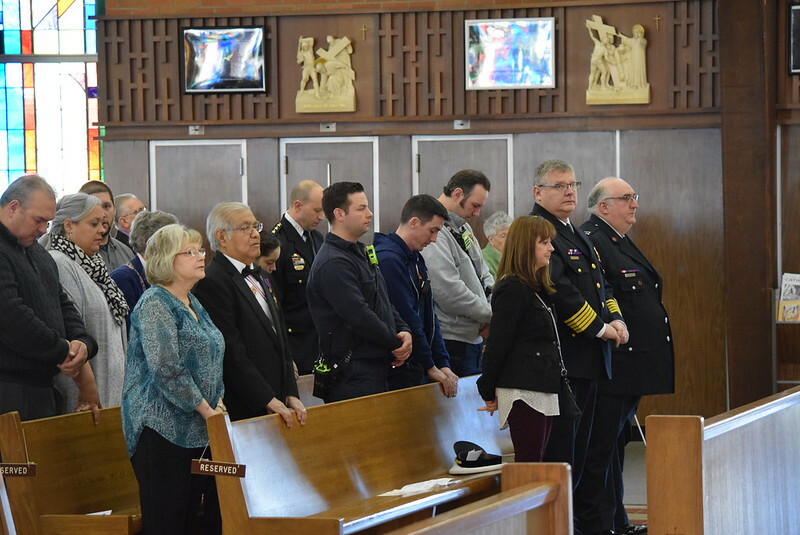 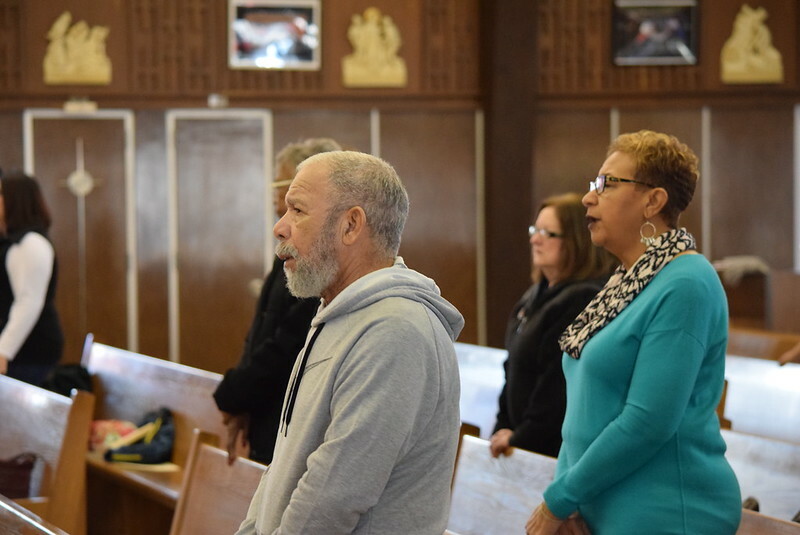 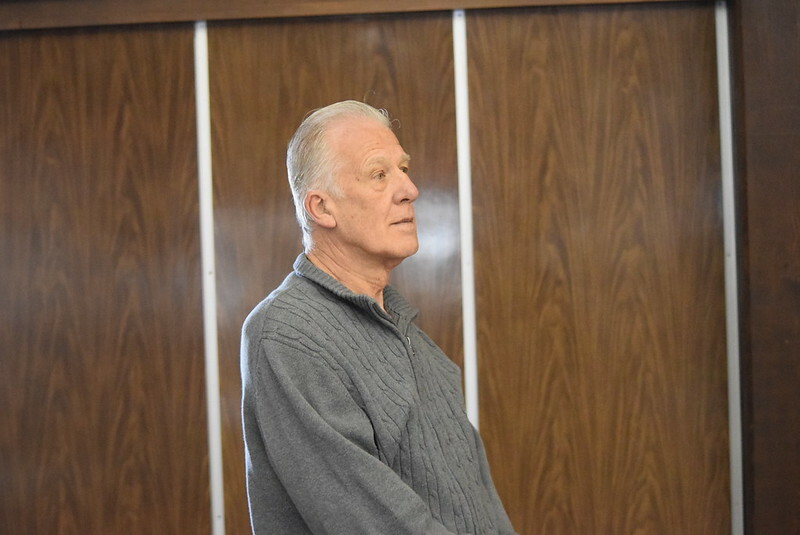 Mayor Ostenburg thanked the police officers, the firefighter paramedics, saying he could recall seeing the anguish on the faces of the first responders the day Tim Jones was shot. 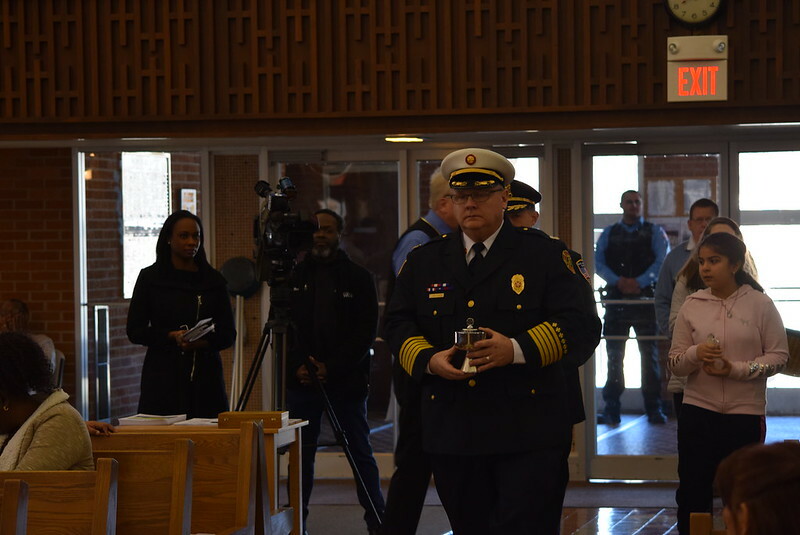 The mayor said he thinks of our first responders ever time you hear of a structure collapse in Chicago or an officer who was shot. 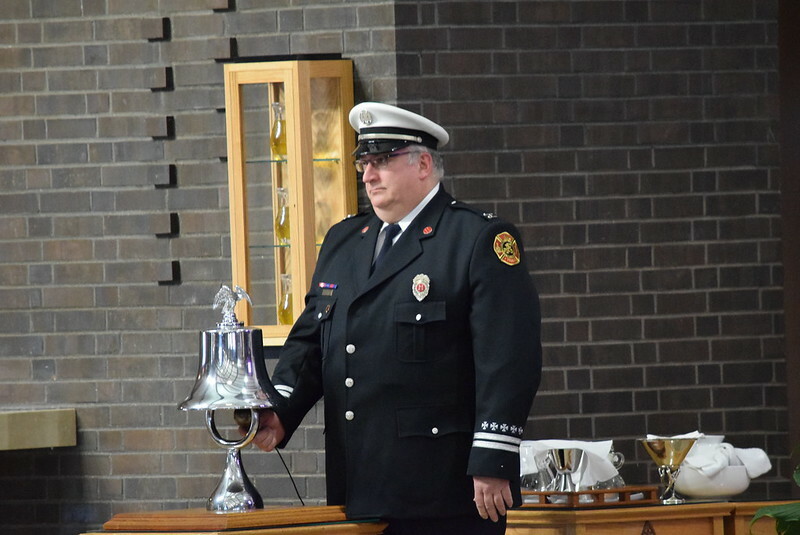 Fire Chief Natyshok remembered all firefighters who fell during the past year, a member of the PFFD ringing a ceremonial bell, three sets of three rings, a tradition part of a firefighter’s funeral for the past 200 years. 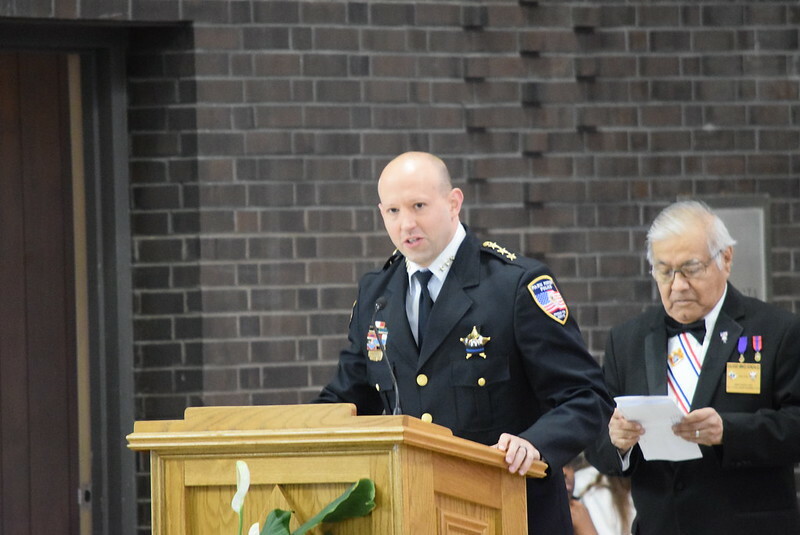 Police Chief Mannino spoke of that day two years ago when Officer Jones was shot. 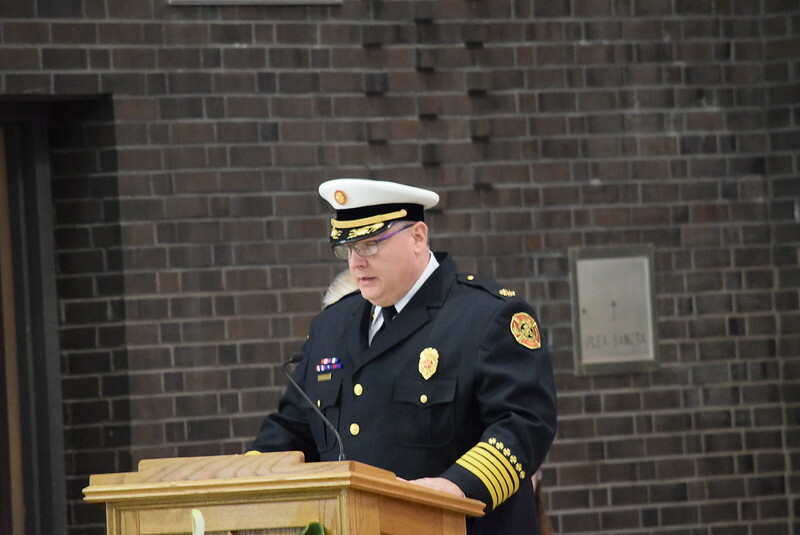 Chief Mannino was told first by a neurologist treating Officer Jones that they rookie officer would not recover at all. 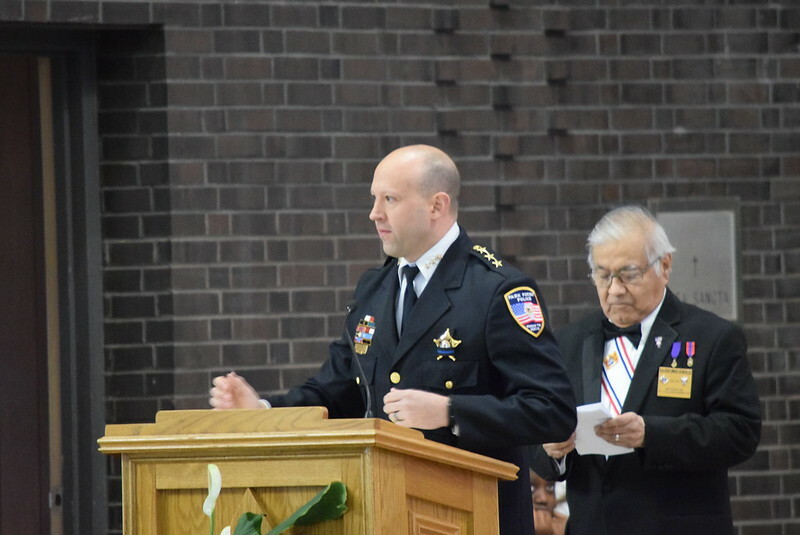 Only days later, he was told Officer Jones would possibly live, but would never wake up. 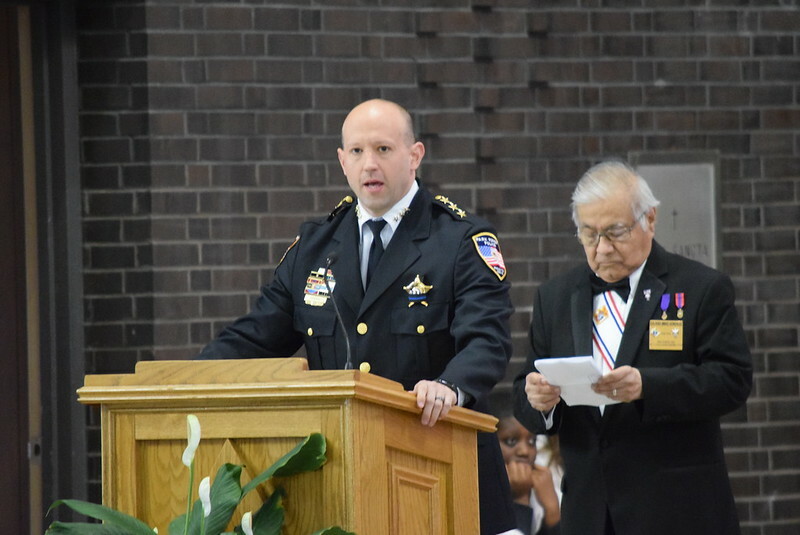 Today, Officer Jones is at home, and scheduled to be in Park Forest Monday as the Village names a portion of Lakewood Boulevard in his honor. 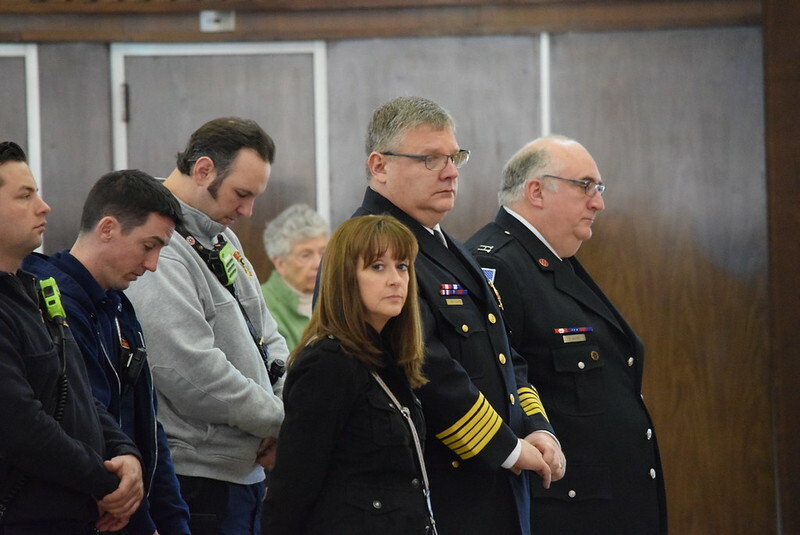 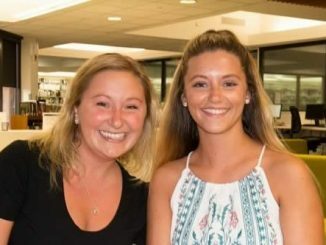 The Village Board will consider, and most certainly approve, a resolution Monday dedicating a portion of Lakewood Boulevard to the Officer who has inspired many with his resilience and determination. 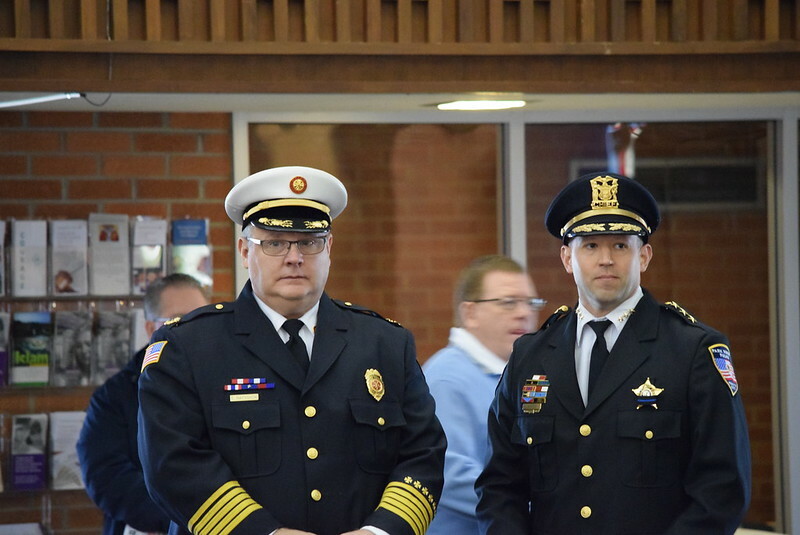 An official unveiling of one of the signs honoring Officer Jones will take place Monday at 6:00 p.m. outside in front of the Police Station, according to Village Manager Tom Mick. 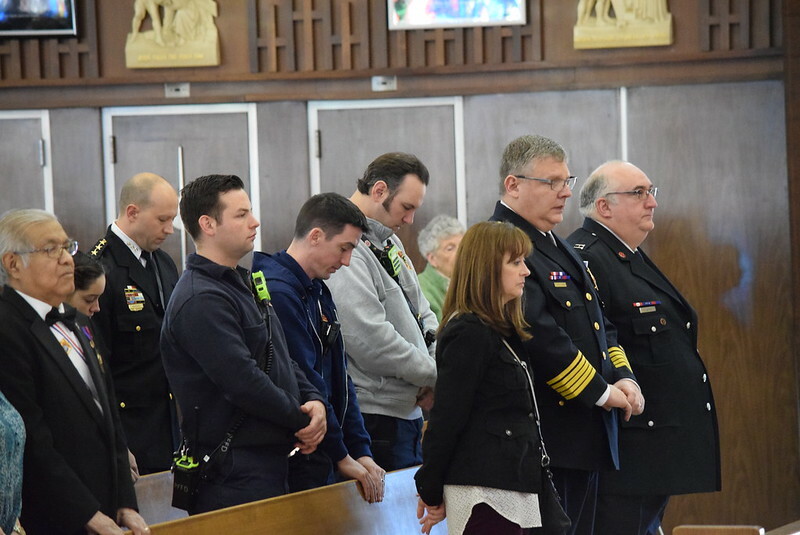 Officials plan to make a formal presentation at the 7:00 p.m. meeting of the Village Board to Officer Jones and his family. 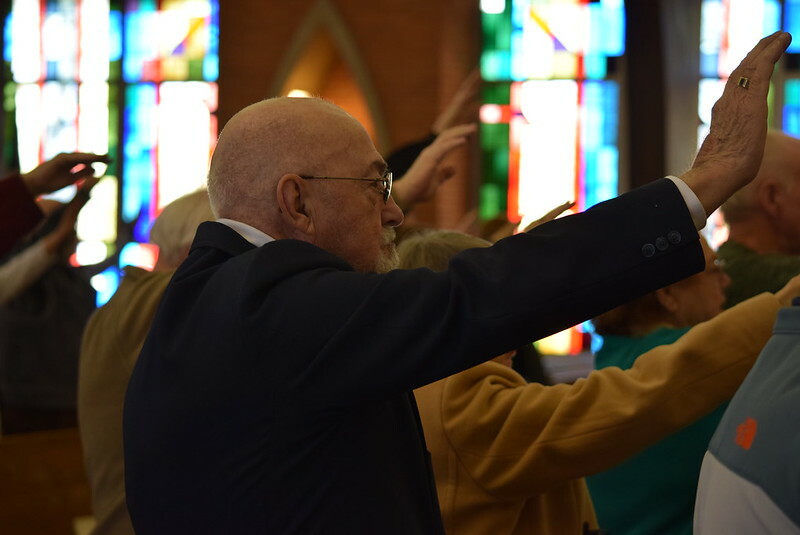 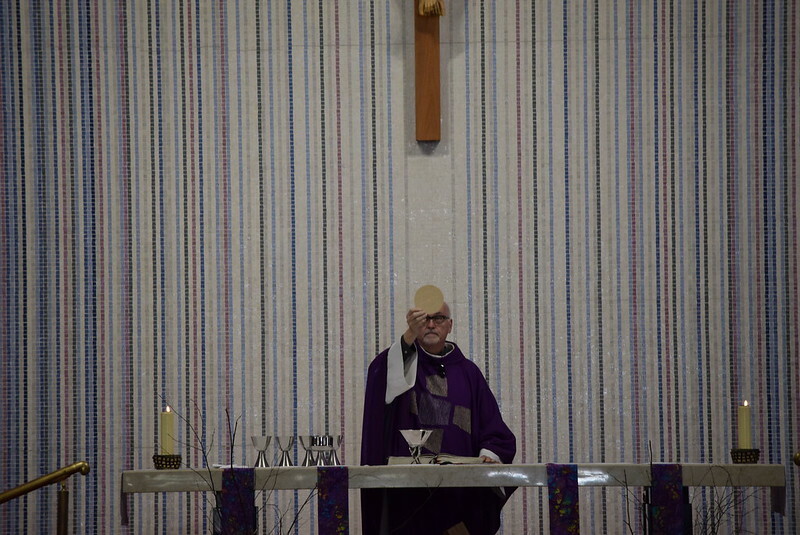 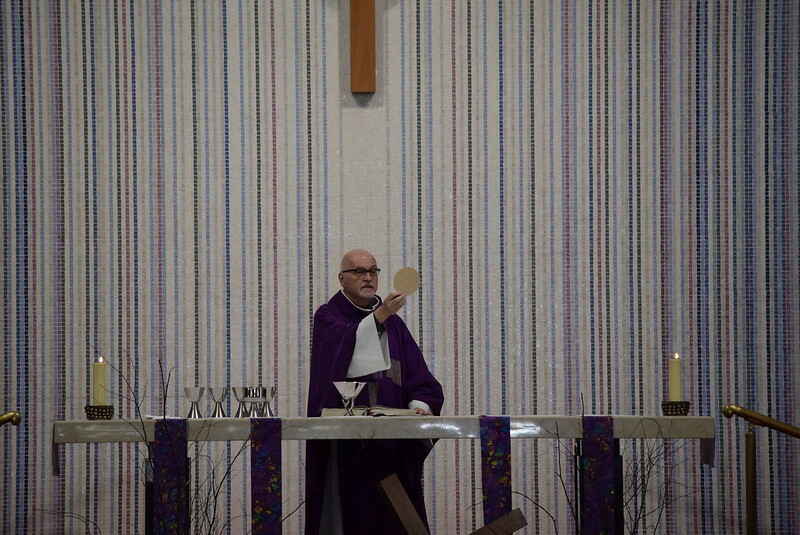 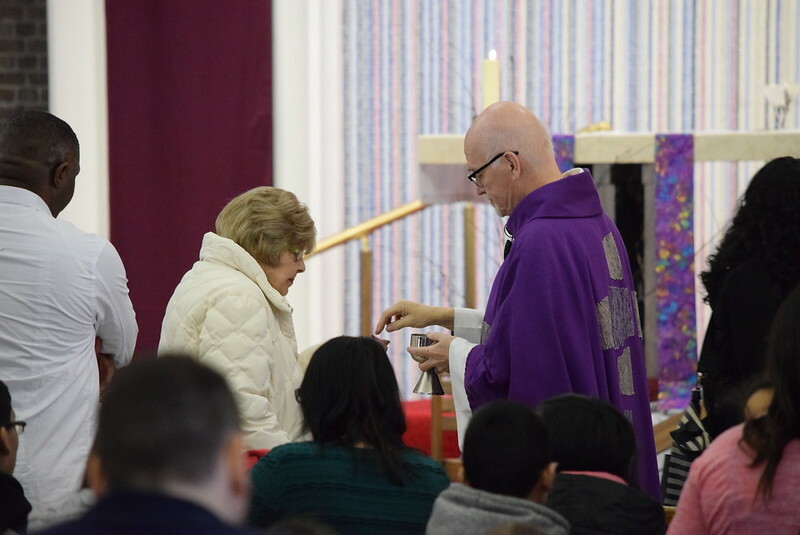 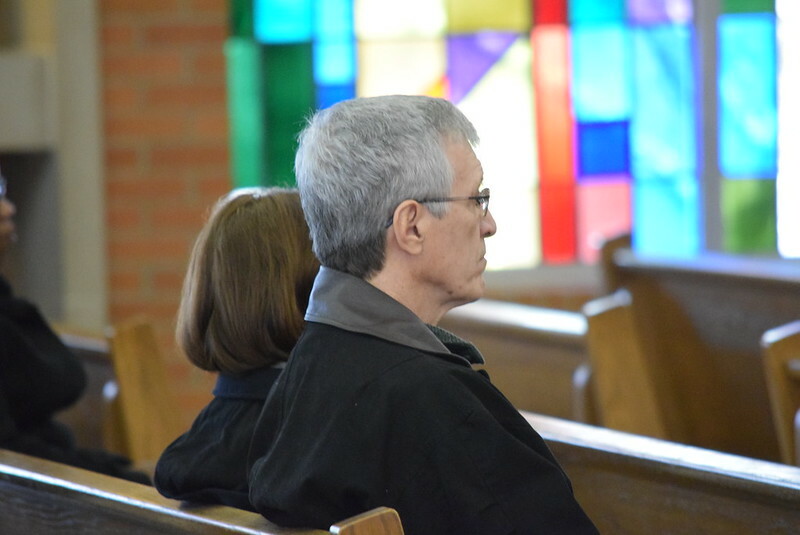 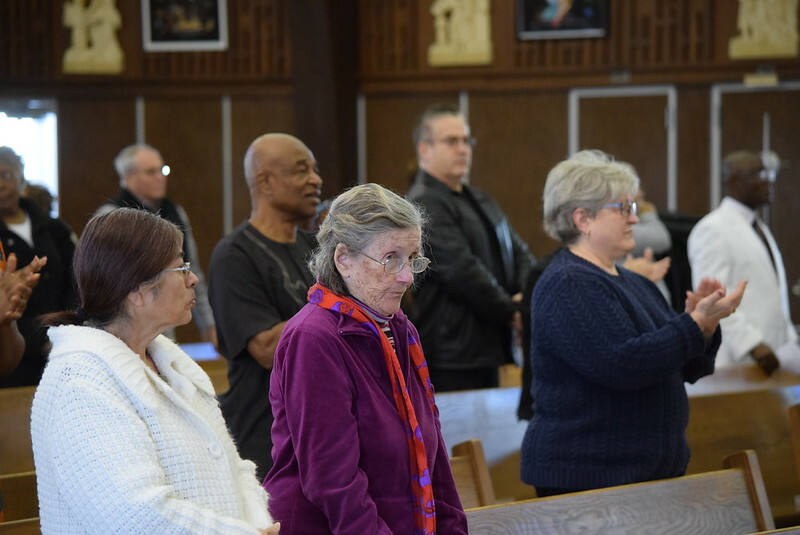 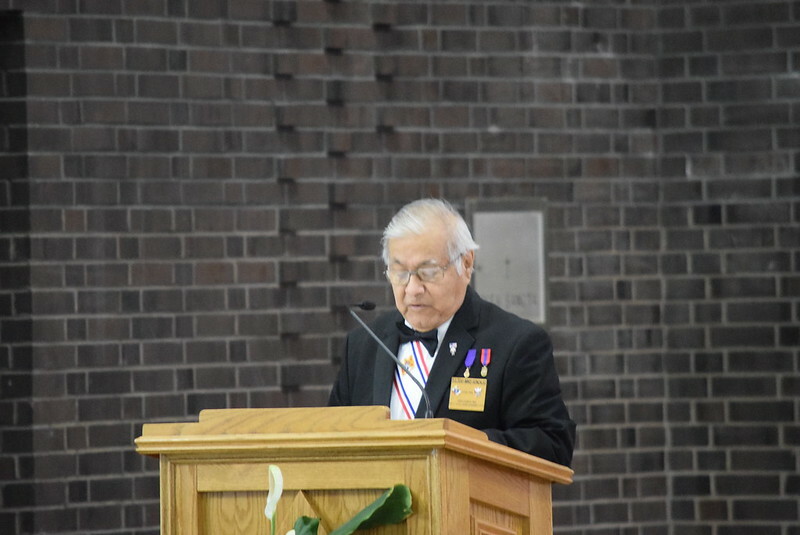 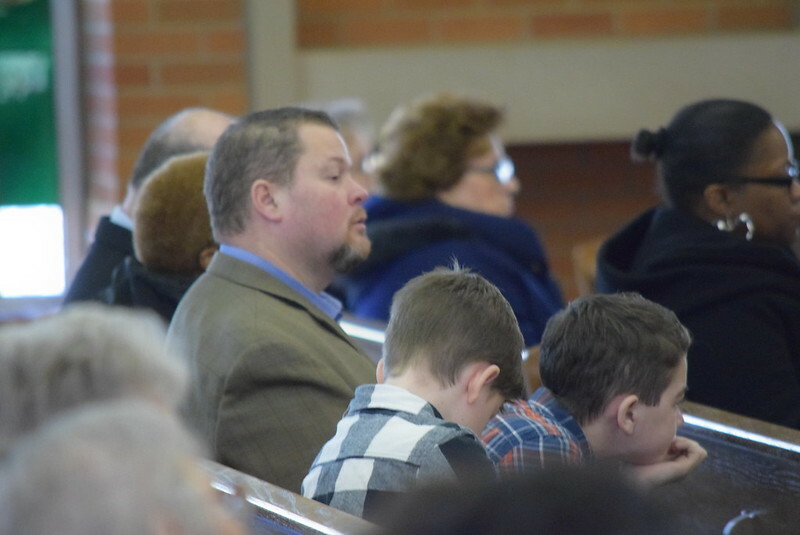 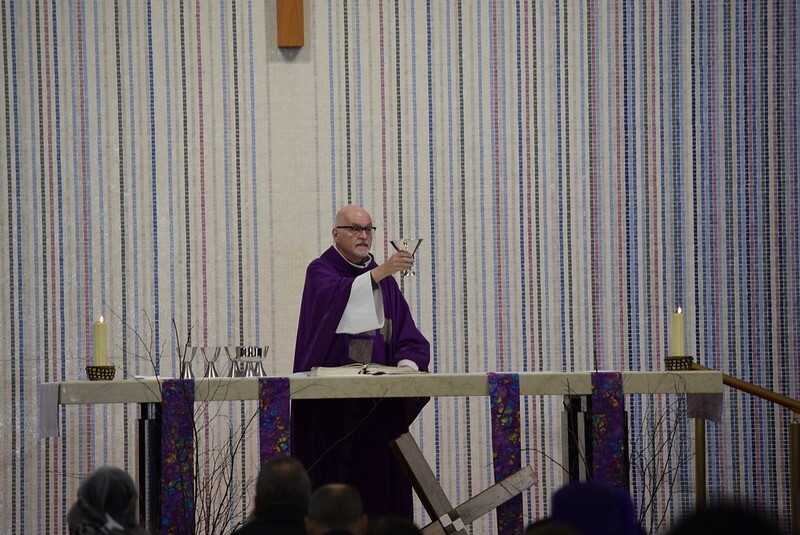 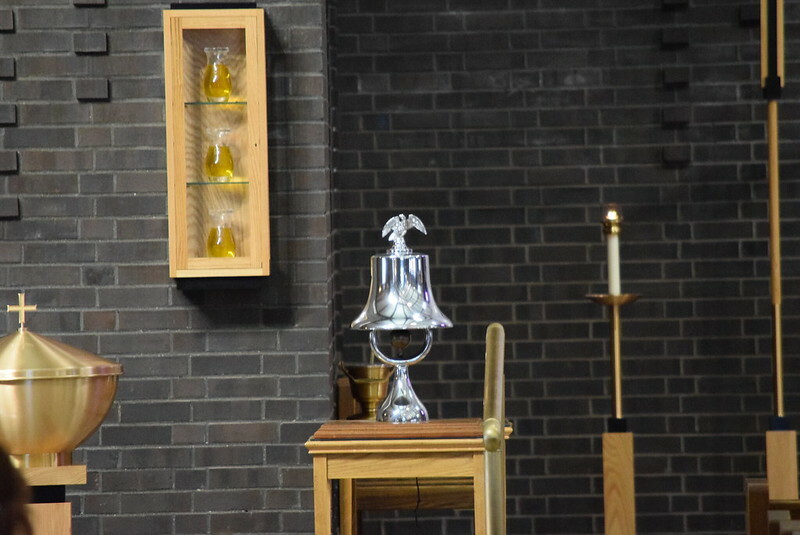 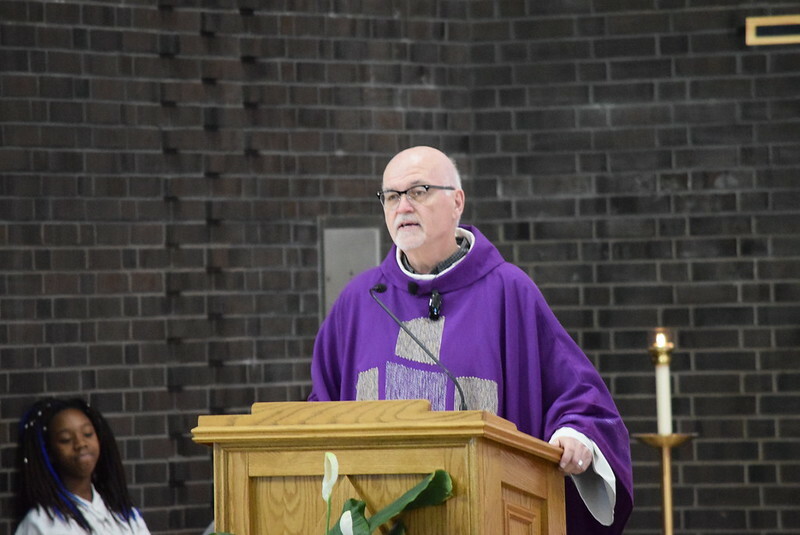 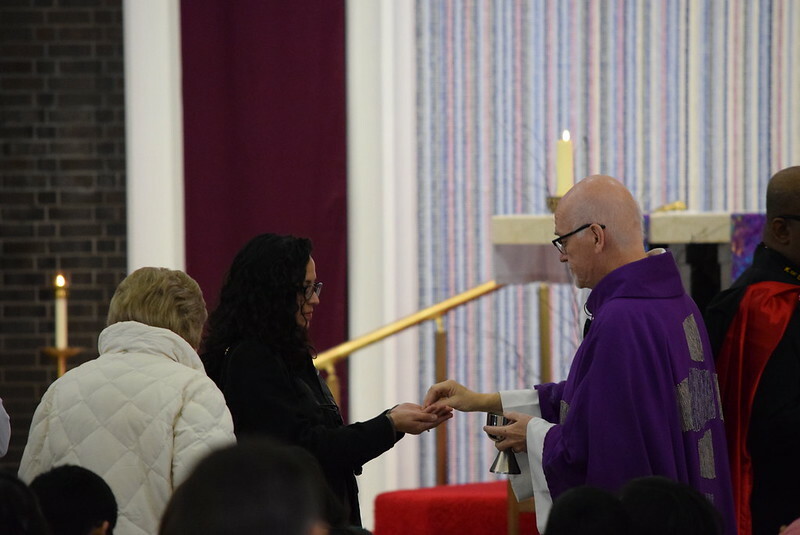 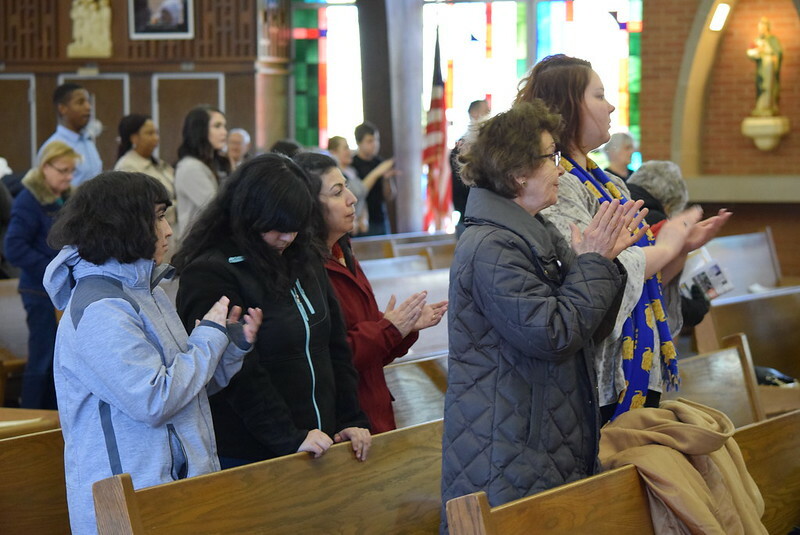 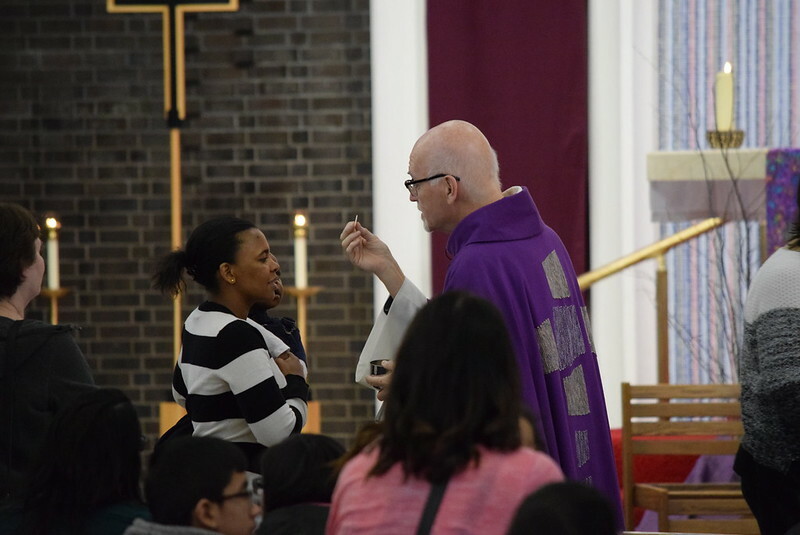 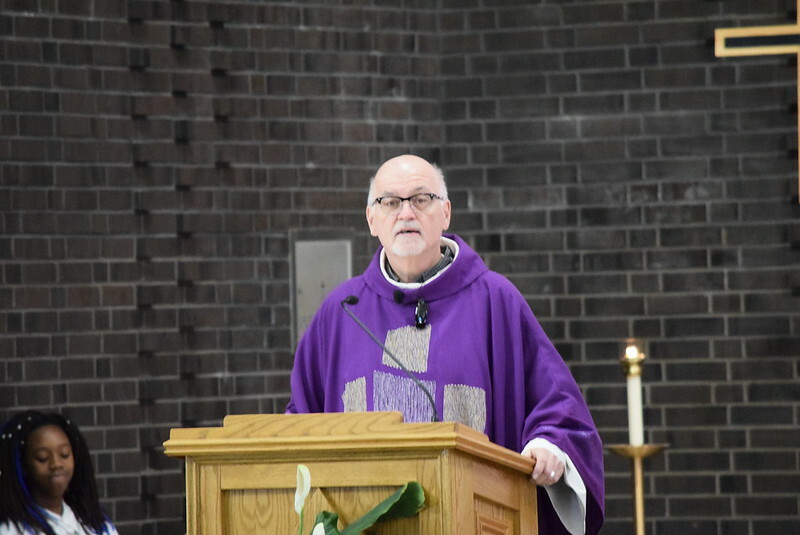 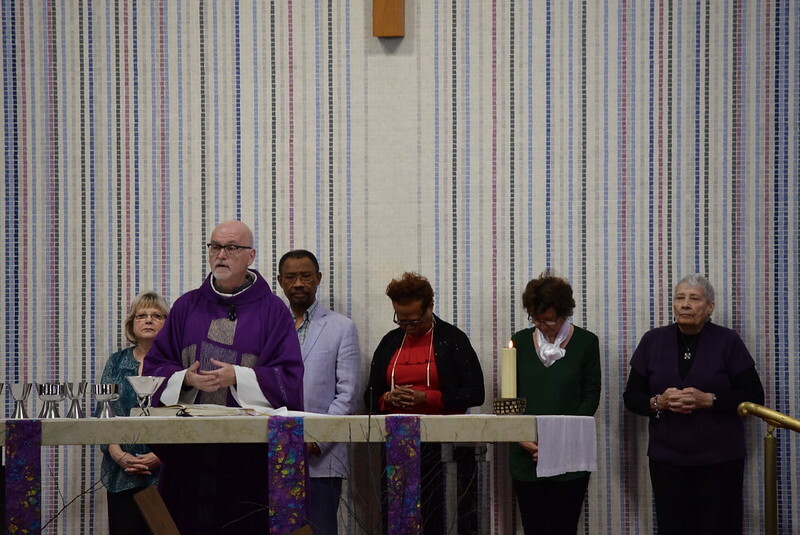 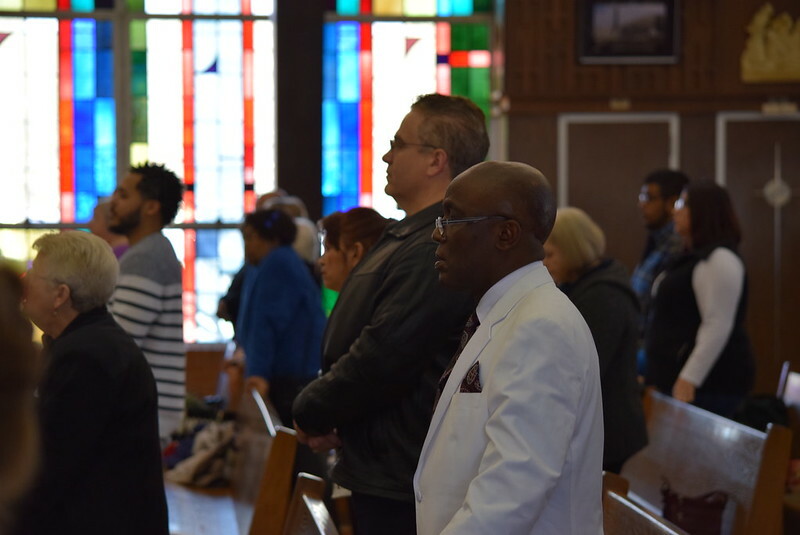 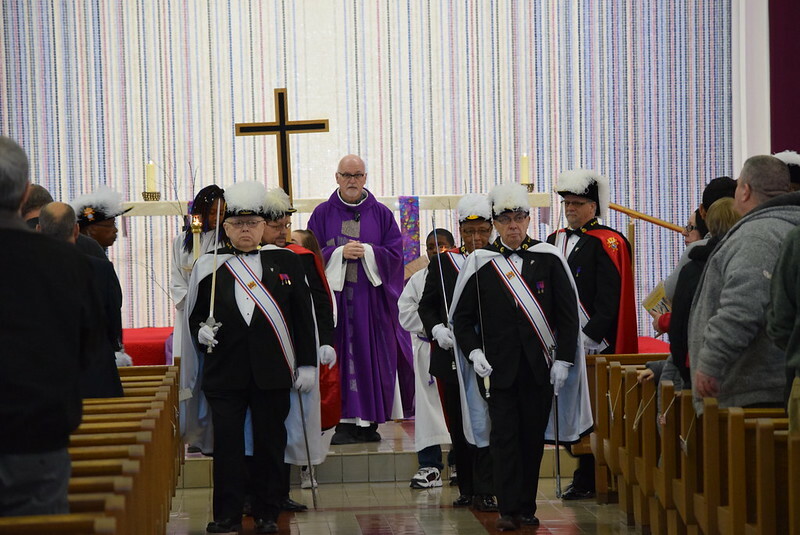 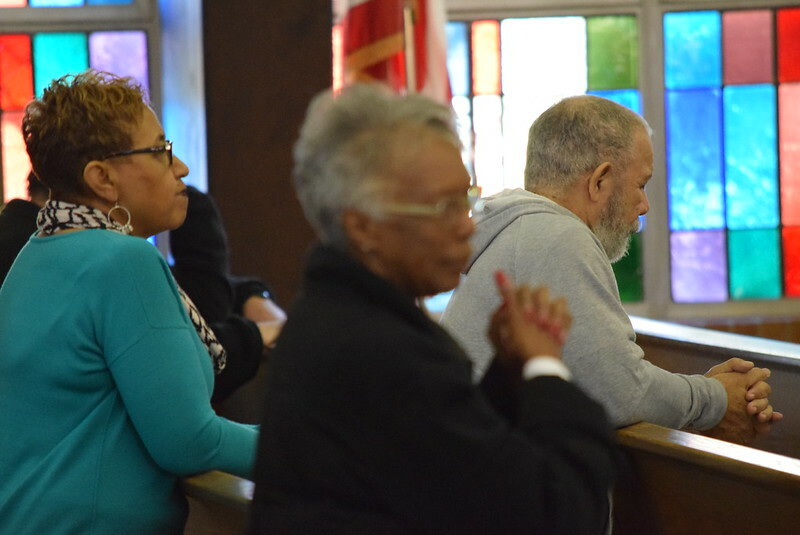 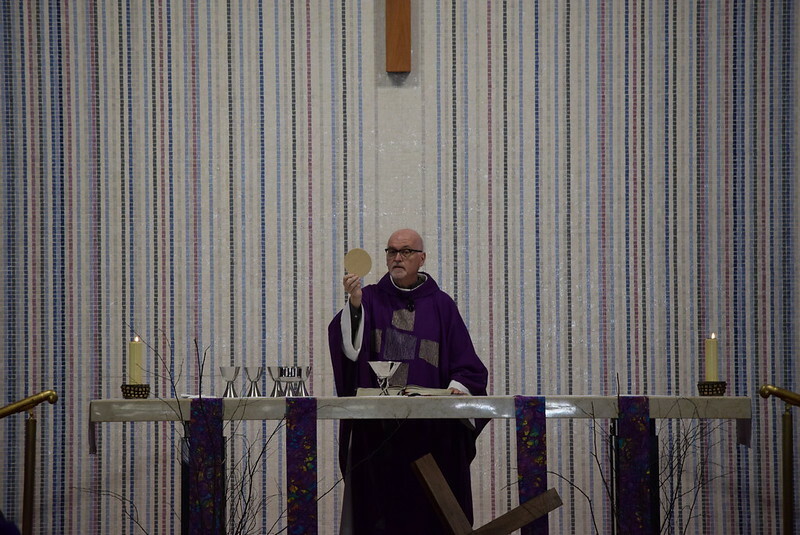 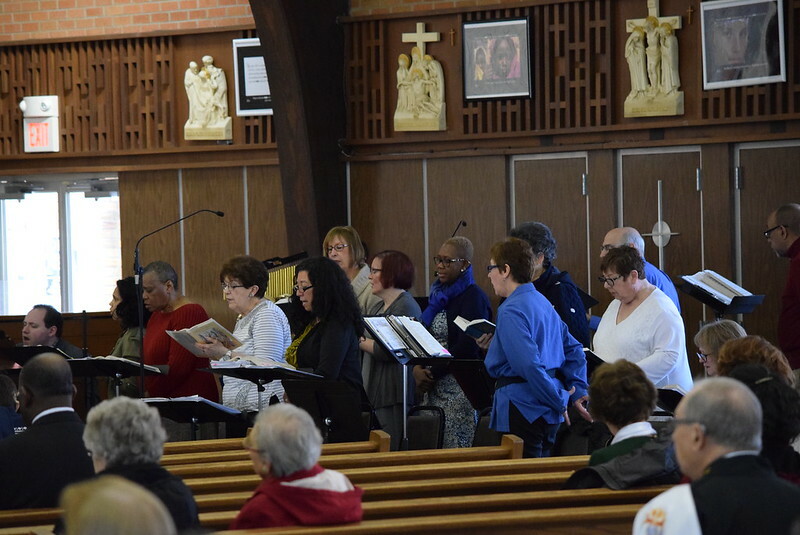 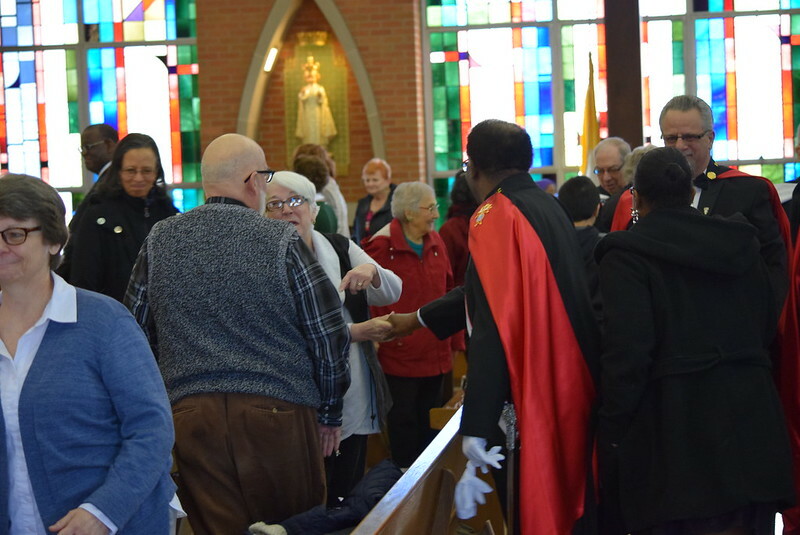 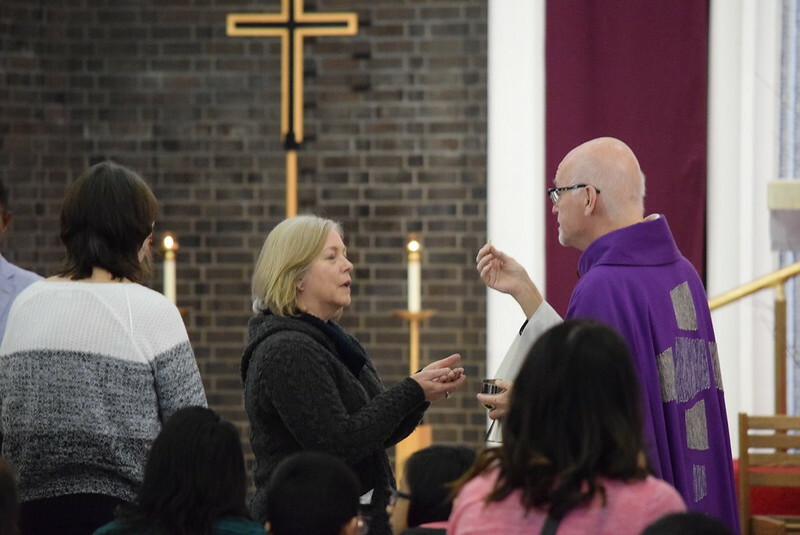 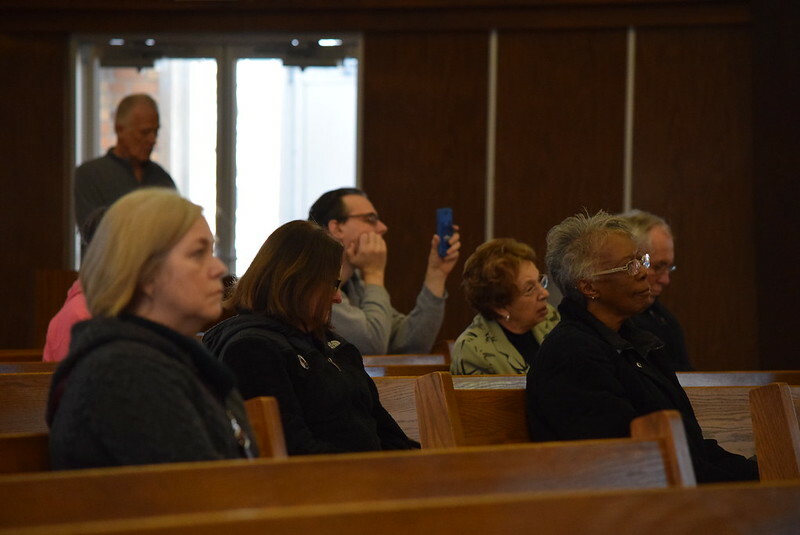 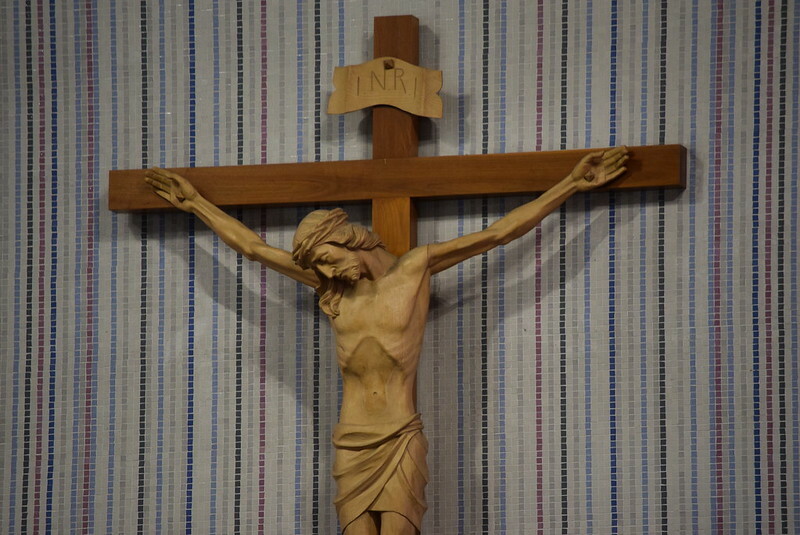 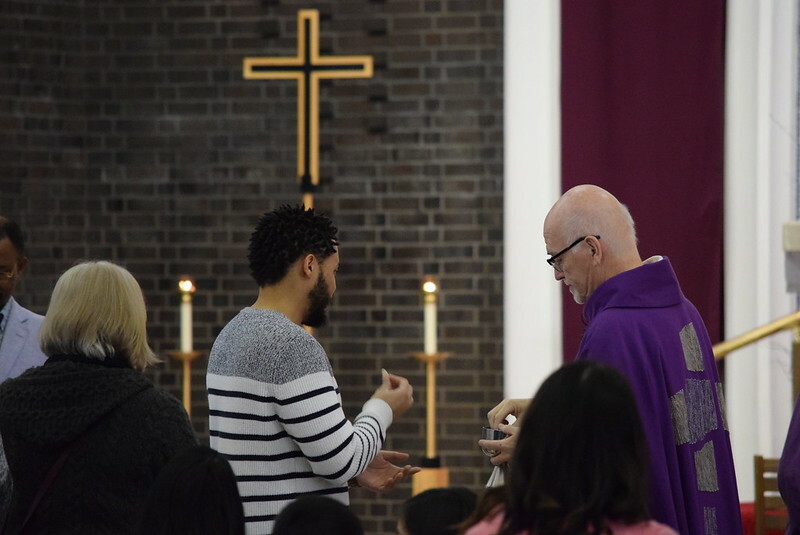 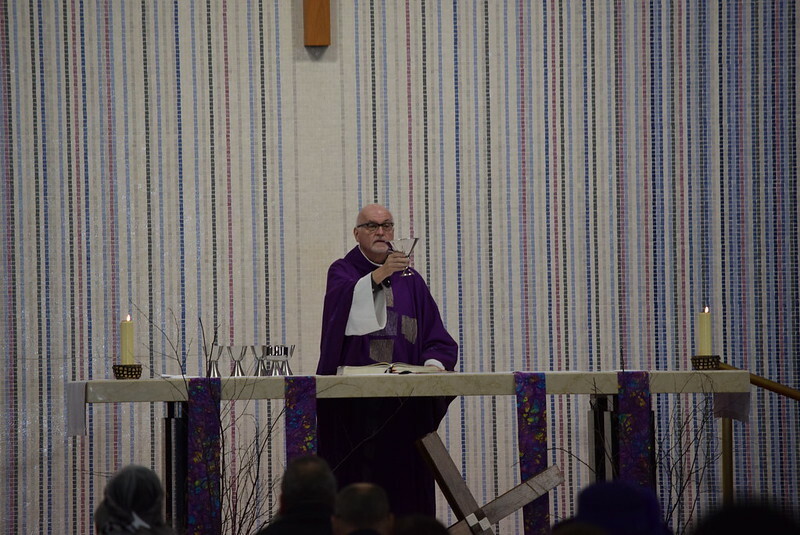 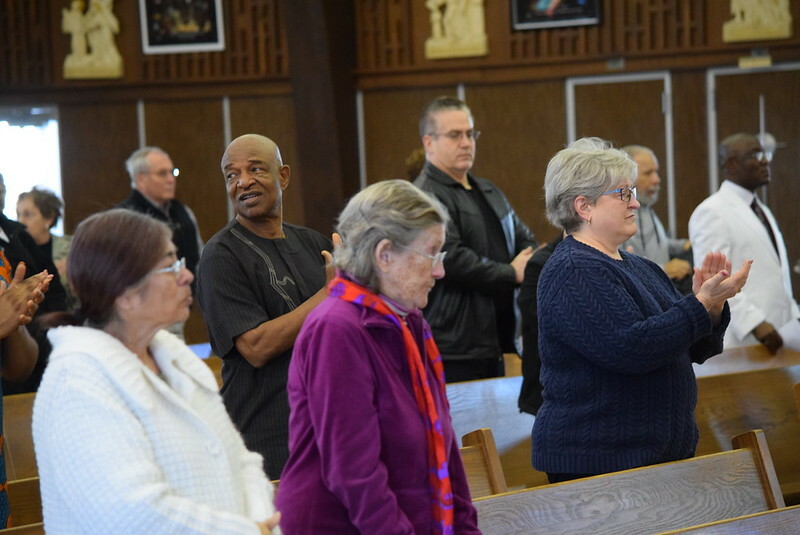 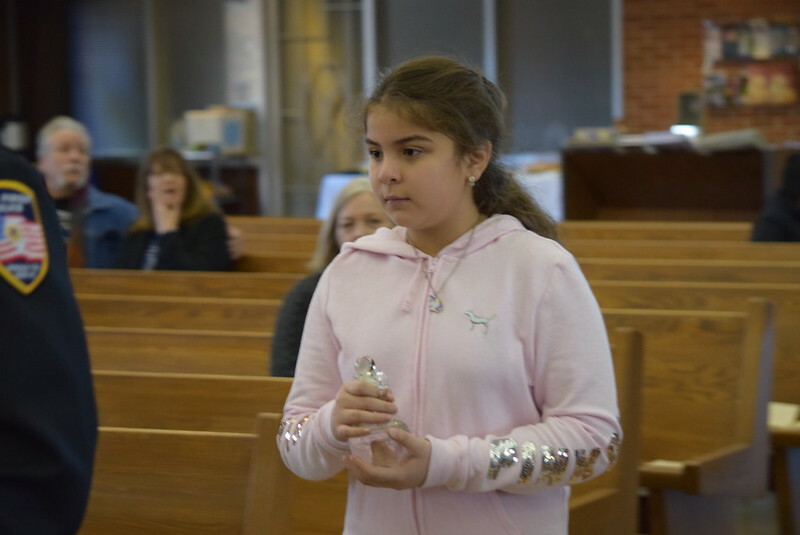 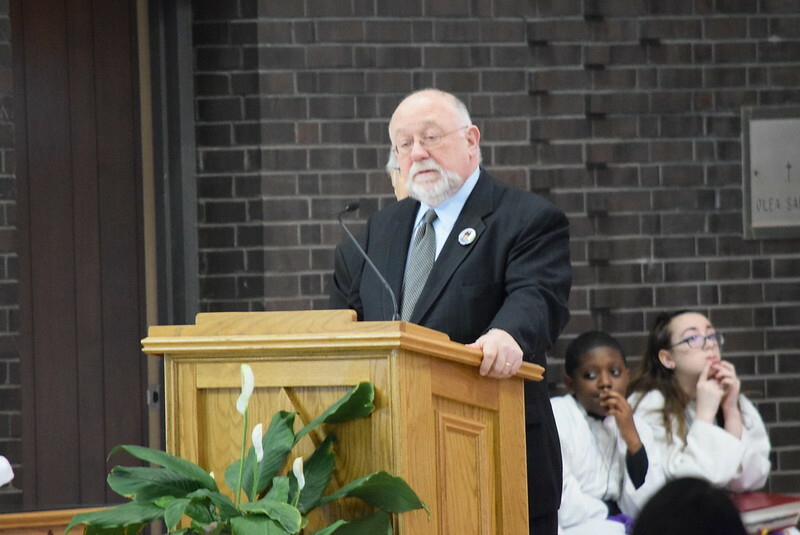 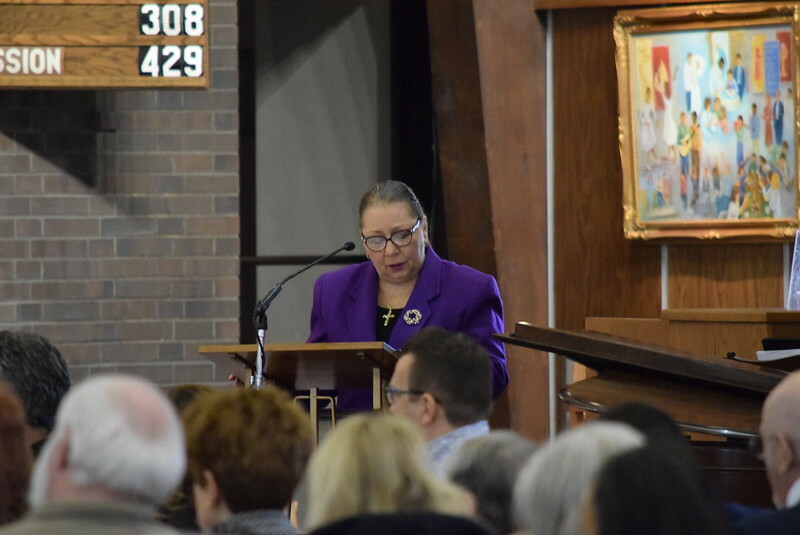 WGN video below the photo gallery from today’s mass.